Novaculite outcrop at archeological site in Montgomery County. Black novaculite boulders, modern whetstone quarry, Garland County. Novaculite samples from modern whetstone quarry, Garland County. Novaculite quarry debris at archeological site in Montgomery County. 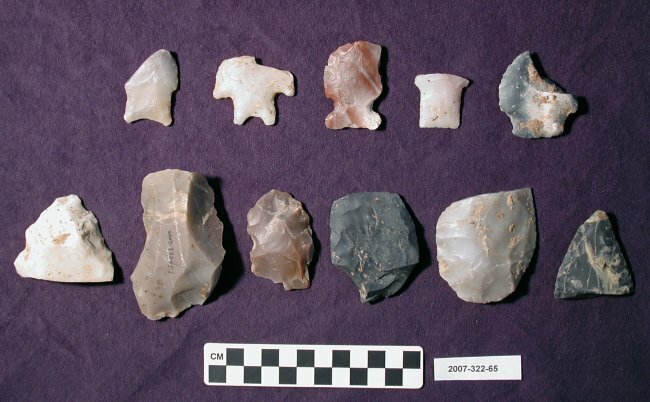 This website showcases the variability in Arkansas Novaculite and its use for stone tools by Native Americans in the past. Here we highlight novaculite quarries as significant archeological sites. The website gathers together data on the distribution of novaculite from the Ouachita Mountains to archeological sites in and beyond Arkansas. We hope to spur new research on ancient trade networks and on chemical characterization and sourcing of novaculite and other toolstone. Follow these links for more information on these topics. A list of major references is provided at the bottom of the page. The Arkansas Archeological Survey is part of the University of Arkansas System, and is charged with preserving Arkansas’s cultural resources and communicating information about Arkansas’s history, archeology, and heritage to the public. We have professional archeologists stationed across the state who serve as researchers, professors, and resource people. If you are interested in learning more about the history and archeology of our state, contact your local research station. The Survey also maintains an education program with lots of flyers and brochures about Arkansas archeology, including one on Arkansas Novaculite. A lesson plan written by Julie Hill, “Arkansas Novaculite: More than a Whetstone,” is available from Butler Center for Arkansas Studies, Little Rock. The Survey’s “Indians of Arkansas” website is a valuable resource for learning more about the Indians who lived here in the past and who are still here today. Indian tribes such as the Quapaw Tribe of Oklahoma, the Osage Nation, the Caddo Nation, and the Tunica-Biloxi Tribe of Louisiana maintain official websites. Explore their sites to learn more about history, culture, and current issues. Artist’s view of American Indians quarrying novaculite in the Ouachita Mountains (from “Arkansas: Crossroads of the Past” slide set, Arkansas Archeological Survey and Arkansas Humanities Council). Archeological sites on federal and Indian lands are protected by federal laws, such as the Archaeological Resources Protection Act. Arkansas also has state laws to protect archeological sites on state-owned lands as well. Federal agencies like the U.S.D.A. Forest Service and the U.S.D.I. National Park Service have information about protecting and preserving history on public lands. The Forest Service’s Passport in Time program offers a way for people to help with historic preservation by volunteering time on projects across the country. Visit our local public lands on the Ouachita National Forest, Hot Springs National Park, and at Arkansas State Parks. How can you get involved in archeology? 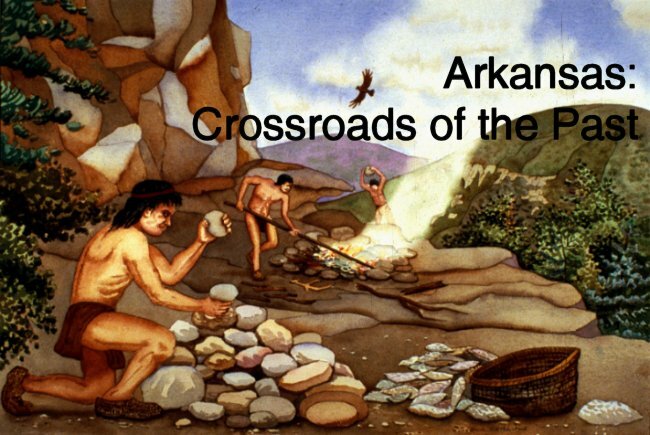 The Arkansas Archeological Society is an organization of people interested in archeology, in learning about Arkansas’s history, and about preserving and protecting archeological sites in the state. There are local chapters that meet regularly for talks and activities. The Society now has a facebook page to communicate with members. Descriptions and illustrations of novaculite are intended for use as a “virtual” lithic comparative collection by researchers who want to be able to identify novaculite artifacts. The Virginia Department of Historic Resources, Division of State Archaeology, maintains “Native American Comparative Collections,” written by Mary Beth Browne and Keith Egloff. The Glenn A. Black Laboratory of Archaeology at Indiana University is developing a Raw Materials Lithic Collection Database. A useful lithics bibliography compiled by Edward Herrmann and Timothy Baumann is linked to that website. There are a few websites that cover toolstone from European sources as well. One that served as a model for our work is Rengert Elburg and Paul van der Kroft’s “FlintSource.net.” Another example is “Lithotheca,” maintained by the Hungarian National Museum. The same organization maintains a “Raw Material Atlas” website as well. The Arkansas Archeological Survey’s “Rock Art in Arkansas” website includes a searchable database of rock art images and motifs. 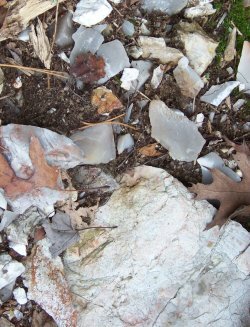 For thousands of years, people living in the Ouachita Mountains chose novaculite for making their tools. 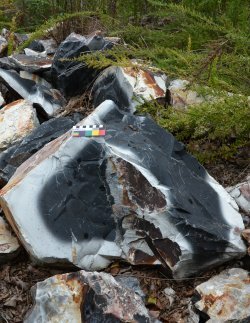 Explore the Arkansas Geological Survey’s website for information about geology, about the Arkansas Novaculite Formation, and about novaculite as an industrial mineral. The Geologic Map of Arkansas can be viewed here. The AGS also maintains an on-line set of geologic quadrangle maps. Hot Springs National Park has an educational brochure, “Follow the Water,” that includes description of the radiolarian and graptolite fossils sometimes found in novaculite. Novaculite is still mined for whetstones today. Companies such as Norton Saint-Gobain, Smith Abrasives, and Dan’s Whetstone Company market whetstones. Novaculite is manufactured into industrial coatings by Malvern Minerals Company. 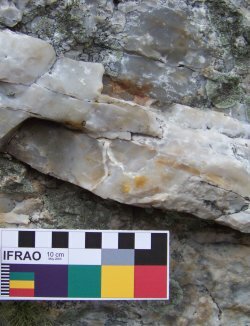 Some archeologists have become interested in experimental replication and learning how ancient flintknappers chipped stone into tools. Other people have become interested in flintknapping as a hobby. 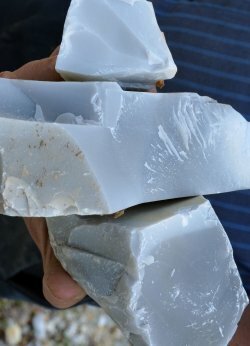 Several companies market novaculite to modern-day flintknappers, including Dan’s Whetstone Company and Magnet Cove Stone Company. 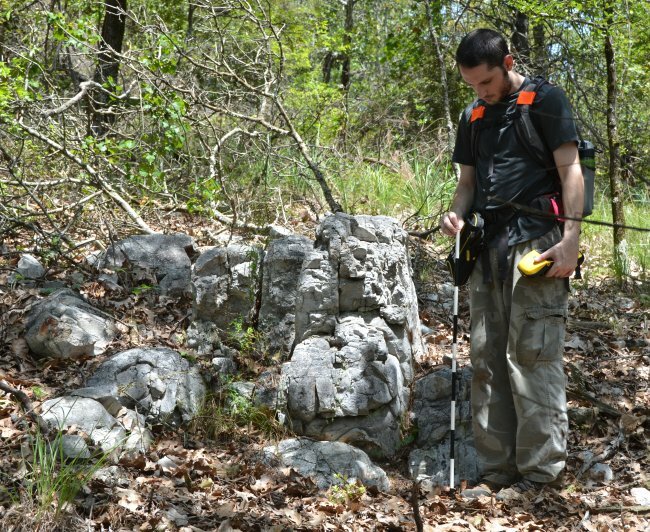 Documenting novaculite quarries and other archeological sites in Arkansas is part of the Arkansas Archeological Survey’s mission. Akridge, D. Glen and Paul H. Benoit (2001) Luminescence Properties of Chert and Some Archaeological Applications. Journal of Archaeological Science 28:143-151. Coleman, Roger E. (2002) Novaculite Acquisition and Use at Little Missouri Falls: An Early Middle Archaic Site in Montgomery County, Arkansas. The Arkansas Archeologist 42:15-43. Gibson, Jon L. (1994) Empirical Characterization of Exchange Systems in Lower Mississippi Valley Prehistory. In Prehistoric Exchange Systems in North America, edited by Timothy G. Baugh and Jonathon E. Ericson, pp. 127-175. Plenum Press, New York. Jeter, Marvin D. and H. Edwin Jackson (1994) Poverty Point Extraction and Exchange: The Arkansas Lithic Connections. In Exchange in the Lower Mississippi Valley and Contiguous Areas at 1100 B.C., edited by Jon L. Gibson. Louisiana Archaeology 17(1990):133-206. Keller, Walter D., Charles G. Stone, and Alice L. Hoersch (1985) Textures of Paleozoic Chert and Novaculite in the Ouachita Mountains of Arkansas and Oklahoma and their Geological Significance. Geological Society of America Bulletin 96:1353-1363. Luedtke, Barbara E. (1992) An Archaeologist's Guide to Chert and Flint. Archaeological Research Tools 7. Institute of Archaeology, University of California, Los Angeles. Peacock, Evan and Samuel O. Brookes, editors (1999) Raw Materials and Exchange in the Mid-South. Archaeological Report No. 29, Mississippi Department of Archives and History, Jackson. Schambach, Frank F. (1998) Pre-Caddoan Cultures in the Trans-Mississippi South. Arkansas Archeological Survey Research Series No. 53, Fayetteville. Whittington, David B. (1969) Arkansas’ Oldest Industry. Arkansas Historical Quarterly 28(3):223-230. Wyckoff, Don G. (2005) Recent Lithic Technological Studies on the Southern Plains and Adjacent Regions, Part I: Identifying and Sourcing Raw Materials. Lithic Technology 30(2):89-105.